pieces are adhered with dimensions. What a darling card!!! She is the sweetest little witch EVER!!! I love your Copic coloring and those Cricut scalloped ovals are great!!! 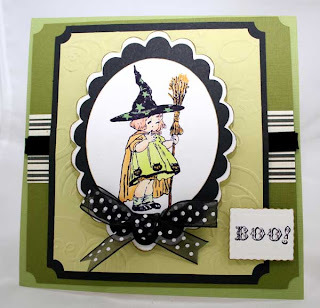 Love the little rectangle Nesties sentiment as well, and, of course, that great ribbon!!! Wonderful job!! !